I’m the pooch protecting my dear Patti (played by Carla Segel) and her presbyterian sisters from these pirate ruffians in SMP’s ‘Pirates of Penzance’. 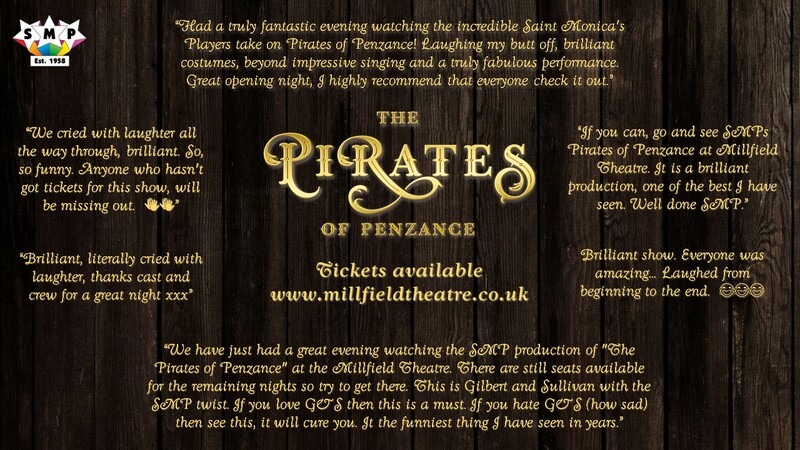 The pirate scoundrels have hounded us all week and last night, our opening night was no exception! There were a lot more pirates than usual yesterday, they were sitting in red seats banging their hands together and making loud cheering noises after each musical number! I will keep my eye on them tonight! I must admit, although I was a little bit scared of the audience pirates, they did help to create a rather fabulous energy for the performers and the production was wildly entertaining for everyone involved! Last night I felt like howling with joy after the show. Patti thought I was just a bit overexcited (I chased my tail just once…) after being around all these people to bark at but it was more than that. I was a proud pup last night. These humans have worked very hard to put on such a good show and to see them performing is a real joy. I’d love everyone to come along and support them so please do book your tickets (and also know that audience pirates will be monitored! ).